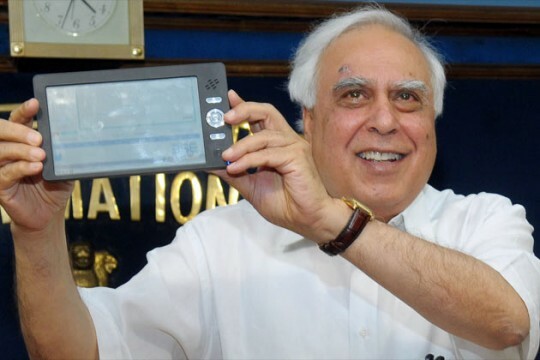 On July 22 a $35 (or 1500 INR) hand-held Linux computing device was unveiled by Shri Kapil Sibal, the Union Minister for Human Resource Development of India. The goal of the project is to lower the price to around $20 in time and eventually reaching the amazing price of $10. The device is under heavy development and is not currently available through retail channels. In fact, its purpose is to provide low-cost capabilities to schools and universities in the tradition of OLPC. It will be able to help students access and complete many online and video-based courses. It was reported that nearly 500 courses have been uploaded to YouTube, sakshat, and National Programme on Technology Enhanced Learning portals and about 8500 colleges have already been connected. In fact, college students and professors helped research and develop the device. Several global manufacturers have expressed interest in mass-producing the device, but no deals have been finalized as of yet even though plans have the devices in students' hands by the end of the year. The technical specification details were sparse mainly due to continuing development, but sources say replacement parts and upgrades should be fairly standard. What we do know is that it will have at least a 7-inch color touch screen (judging from the photos), 2 GB of storage, WiFi, Ethernet, 2 watts of power consumption (going by earlier incarnations), a solar-power option, and a custom scaled-down version of Linux. Further speculation has it powered by an ARM-based controller and including a low-power webcam. Reports have indicated that several variations may eventually become available with different options and configurations. There's a long path between prototype and retail packaging, but excitement is high. There is no question of the value to India's college students, especially with rumored government subsidies in discussion. But if this device could be shipped world-wide to the general public it could likely become stiff competition to the OLPC, smart phones, netbooks, and the various new tablets announced lately. In fact, at that price it could very well become an Everything-killer!